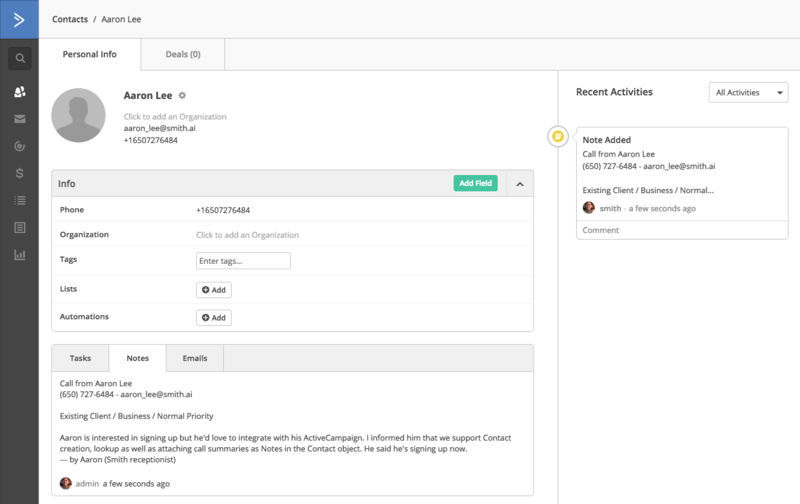 ActiveCampaign is a CRM built for small businesses, offering tools for both contact record management and marketing and sales automation. Smith.ai now integrates with ActiveCampaign so callers' contact information and post-call summaries are logged in your records instantly after each call. New contacts are added and existing contacts are updated, with full transparency that these activities came from Smith.ai. A contact record that is created or updated by a receptionist after a call will appear in your account like the screenshot below. Check out how the call summary appears in the contact's Notes section. The activity is also logged on the right side of the screen, and you'll see new activities appear any time a contact is updated or notes are added. These activities will be attributed to the "Smith" user. Log in to your Active Campaign account. Go to Settings, and then click on "Developer." 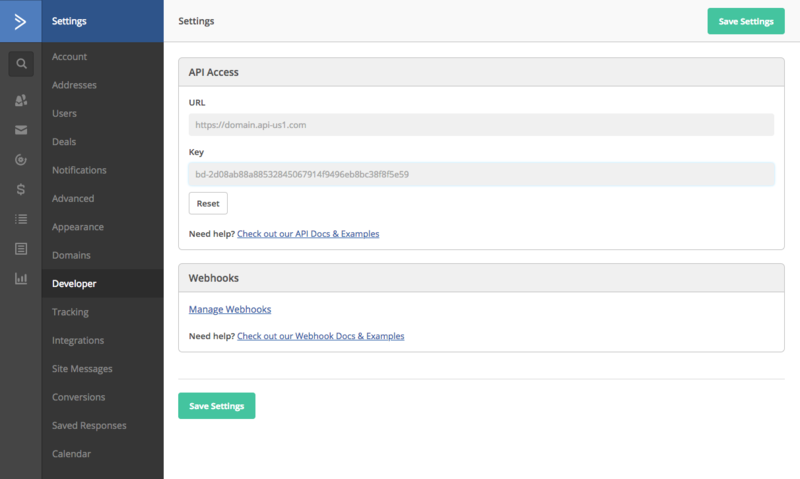 Under "API Access," copy the URL and Key and paste them into an email to support@smith.ai with the subject line, "ActiveCampaign Integration." That's it! We'll let you know as soon as the integration is complete, typically within 1 business day. Once your accounts are linked, you'll see ActiveCampaign contacts and call summaries added and updated by your receptionists after each call. Not sure how you can best leverage the ActiveCampaign integration with your Smith.ai receptionists? We're happy to discuss implementation options and best practices. Please reach Smith.ai Support Monday through Friday, 5am – 6pm PT / 8am – 9pm ET via phone at (650) 727-6484 or via email at support@smith.ai.